So I had every intention of posting this last weekend, but of course it didn't happen due to exhaustion. Did anyone else feel like the past two weeks were never going to end? Seriously, I swear the past 2 weeks lasted a whole month. Fourteen days ago, although it feels like at least 20, I was feeling great about getting on the ball in this new year. I pulled my blogging calendar together, I planned the next few weeks of posts, figured out what I was going to eat each week for the next couple of weeks, I had good, healthy lunches and dinners planned, I had my crafts list ready and rarin to go, and then it all went to hell! Sometimes you just can't do it all. I can't really put my finger on why the past two weeks have seemed so intense. I would imagine it's just a combination of events... I had to stay late at the office a couple of nights, I may have over extended myself last weekend by trying to be the new Stephen Spielberg of food blogging, and I had to drop everything and head to Phoenix this past week with only a few days notice, although I'm not complaining... would you? So, when I was still on top of my organization game 2 weekends ago, as you may remember from my last post, I cooked 3 beautiful main dishes that I was going to eat throughout the week for lunches and dinner and be able to share with you this month. I was so glad I cooked so much food that weekend, it was so nice to sit down at lunch and have a balanced, nutritious and delicious lunch, instead of something scraped together! I highly recommend making delicious and nutritious food the weekend before a big work week. Two weeks ago, I shared my onion, date, and goat cheese stuffed chicken, which is quite possibly in a tie for my favorite make ahead meal, closely behind the easy pork tenderloin recipe I'm sharing with you this week. This recipe really is one of the easiest dinners/weekly lunch prep. If it's more than just you and your significant other, thrown another tenderloin in the pan and cook up two. The leftovers are great on top of a hearty salad or they make a great sandwich served on fresh french bread with whole grain mustard and apricot jam. I had a pork sandwich for a quick dinner, and after a long day of working and it was just perfect, exactly what I needed. I'm not sure what made that week drag on, and on, sure, I had a ton to do and not enough time to do it, but that's the norm! It's not like I was looking ahead to a holiday weekend or anything. You see you might be laughing, thinking, it was a holiday weekend! Not for me! I can't wait to share the fruits of our labor with you! I'm stoked to finally to this. I've been thinking about it for at least 6 months, but I didn't know how I could pull it off in my tiny little kitchen by myself. That was the trick, enlisting Amy to help! She's so precious, how could I not beg her, and I knew she'd totally do it, she's up for anything! Isn't she just too cute. Don't listen to people when they say co-workers can't be good friends, I'm glad I didn't! So, after all that great preparation and having-it-togetherness two weeks ago, last week was a complete 180 degrees from that state of mind. I ate cereal every night the first part of the week, until I left for Phoenix, and I don't even remember eating lunch. I think one day I had some Asiago cheese, refried beans, wilted spinach, and a fried egg. Now, as random as it was, it was delicious, but still. What was I thinking when I pulled those ingredients from the fridge and stuffed them in my lunch box? I was wishing I would have had some of this leftover pork multiple times throughout the week. So, do yourself a favor, head to the store, pick up the ingredients, and make this at some point this week! Like I've been preaching in my last few posts, pull everything together. 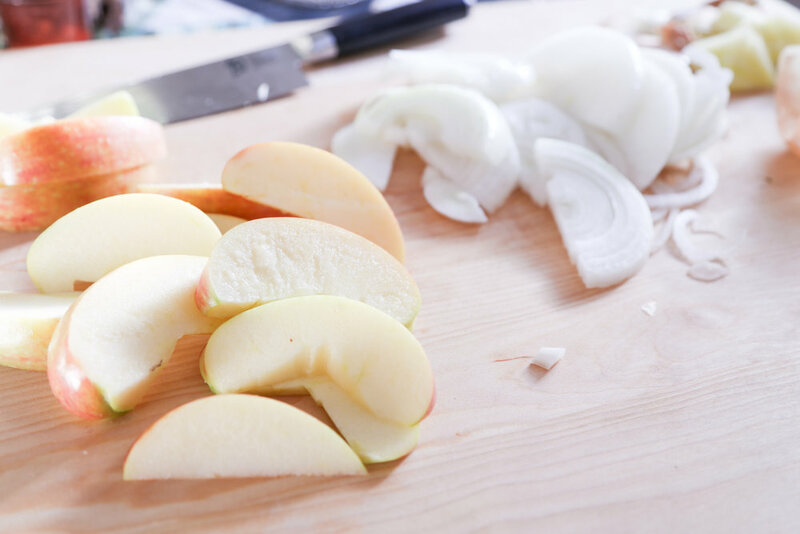 Start by slicing the apples and onions. Make the rub for the pork by combining the oil, whole grain mustard, apricot jam, garlic powder, and Montreal seasoning. Cover the pork in the rub and then let it sit while you heat up an oven proof dish. Drizzle a good amount of olive oil in the pan. Make sure they pan is searing hot by dropping a few drops of water in the pan. Be careful, it will be hot and it will pop! Sear the meat on all sides, about a minute or two a side. Remove the pork from the pan, turn down the heat, add some more oil, and the sliced onions with a dash of salt. Caramelize the onions, remember, this is a long, slow process. Don't rush it! You might have to deglaze the pan if it looks like it's burning more than caramelizing. To do this, take some apple juice and just add enough to make a small layer on the bottom of the pan. After the onions are nice and caramelized, add the apples. Give them a good stir and let cook about a minute. Add the pork to the pan, fill the bottom with apple juice, cover, and pop it in the oven. Cook the pork for about 30 minutes or so, remove the lid, cook an additional 10 minutes, or until the internal temperature reaches 145 degrees. Well, what do you think? Are you going to give this easy weeknight dinner a try? If you do, let me know! I love to get feedback and see what you're making!